Tofu scramble is a popular vegetarian and vegan breakfast dish because it is quick and easy to make, nutritious - especially if you add extra veggies - and of course, very tasty as well! This recipe uses vegetarian "bacon" for a traditional American breakfast taste - vegan "bacon and eggs"! When I first went vegan, I'll admit I wasn't a big fan of fake bacon, but I've since really grown to like it on occasion, and I think you'll find that even if it doesn't quite taste the same as regular bacon, the smell is quite convincing, and it looks great on your plate! And, I can't say this strongly enough, once you finish your vegan "bacon and eggs" breakfast, you simply must (must!) try out these vegan chocolate chip bacon and sea salt cookies if you are also a fan of vegetarian bacon (and even if you're not). They are exactly as amazing as you would think. Another fun way to use vegetarian bacon? Try this vegan grilled cheese with veggie bacon recipe. Like this recipe? 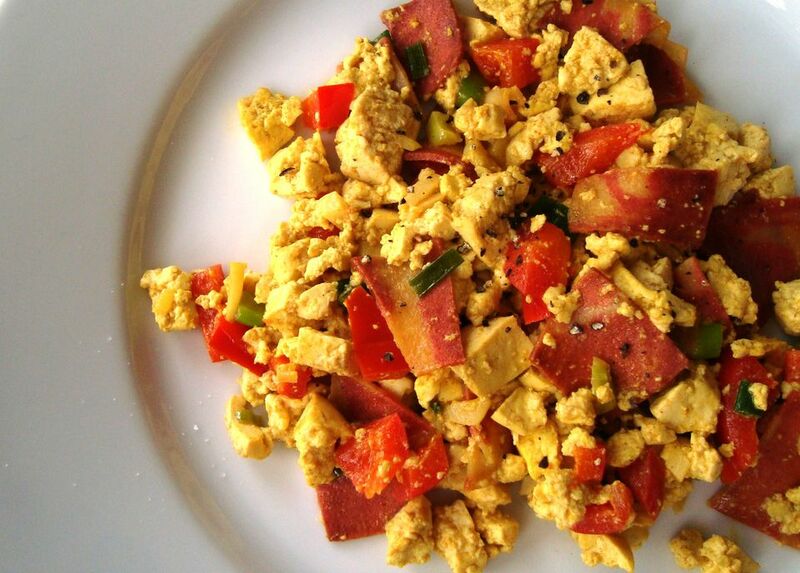 You might also want to try some other tofu scramble recipes. Cook the vegetarian "bacon" in olive oil for a few minutes on each side, just until the vegetarian bacon is cooked but not crisp. Allow it to cool slightly, then cut your vegetarian bacon into bite-sized pieces, about 3/4 inch square. Next, return the cut vegetarian bacon to the pan along with the mashed tofu, chopped onions, red bell pepper, turmeric and soy sauce, stirring to combine. Allow the tofu to cook, stirring occasionally, for about 5 to 7 minutes, stirring frequently and adding more oil if needed. Remove the pan from heat and stir in the nutritional yeast. Season gently with salt and pepper to taste. Sea salt or kosher salt and fresh ground black pepper will always give you the best flavor. Cheesy stuffed potato skins with veggie "bacon"